Laura Korte successfully defends her "dusty" PhD thesis! Over the past week, some of DUSTCO’s team members gathered together in The Netherlands, to take part of the PhD public defense of Laura Korte, at the Vrije Amsterdam University. Laura successfully defended her thesis “Saharan dust deposition in the equatorial North Atlantic Ocean and its impact on particle export fluxes”, in front of a committee of six experts in the fields of marine biology, marine environmental sciences and (paleo-)oceanography. The committee included big names in science such as Prof. Dr. Tim Jickells from the University of East Anglia (UK), Dr. Cecille Guieu from the Centre National de la Recherche Scientifique (France), Prof. Dr. Karine Desboeufs from the Paris Diderot University (France) and Prof. Dr. Dr. h.c. Ge­r­old We­fer from the University of Bremen and MARUM (Germany). 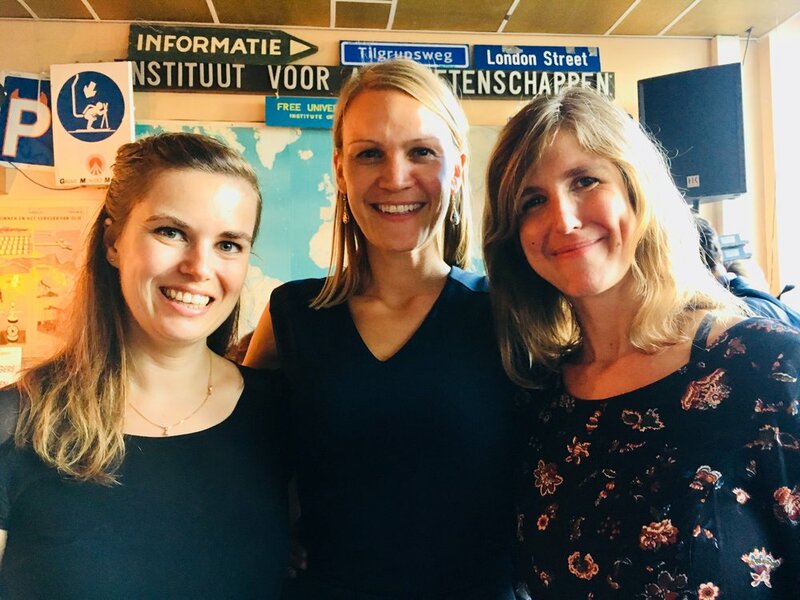 Laura Korte presenting her PhD research at the Vrije Amsterdam University, flanked by her two paranymphs Michelle van der Does and Catarina Guerreiro. Here you can the newly fresh Dr. Laura Korte surrounded by her thesis-committee members as well as the (co)promotors and the paranymphs. Laura’s PhD research was performed within DUSTTRAFFIC, an ERC-funded project formerly ongoing at the Royal Netherlands Institute Research, based on particle flux material collected from sediment trap moorings that had been deployed between the NW Africa and the Caribbean, collecting particles synchronously for three consecutive years. Her work represents a step forward on the existing knowledge about the influence of atmospheric dust in the marine environment, in particular of Saharan dust deposition along the tropical North Atlantic. The thesis provides a multidisciplinary perspective on such effects, for which she has combined in situ observations from the traps with satellite remote sensing data, as well as insights from an incubation experiment for testing the influence Saharan dust deposition on phytoplankton production in the tropical North Atlantic. The cover of Laura’s thesis! Some of the members of the Dusty Team celebrating the successful PhD defense of Laura! Newer PostNew dusty-paper from Laura Korte on Biogeosciences Discussions! Older PostTesting dust-fertilisation in the lab!